(from page 5 of the 1977 Collection) Dark Brown 1977 Mustang Ghia optioned coupe with a 5.0 liter (302ci), 134hp (at 4000rpm), 2 barrel, V8 engine. The 1977 Ghia optioned Mustang came with half vinyl roof, pinstripes, unique wheel covers, body side molding, color-keyed interior vinyl inserts and optional Media Velour cloth with large armrests (which this car has). (from page 5 of the 1977 Collection) Dark Brown 1977 Mustang Ghia optioned coupe, rear left view showing the luggage rack option. 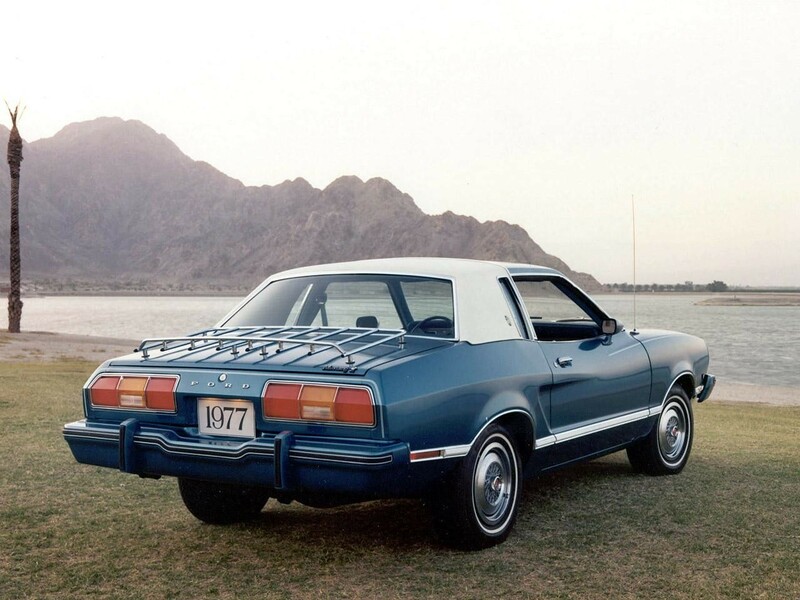 (from page 5 of the 1977 Collection) Rear view of a Dark Brown 1977 Mustang Ghia optioned coupe with luggage rack. (from page 9 of the 1977 Collection) White 1977 Ghia optioned Mustang II coupe, front view. (from page 9 of the 1977 Collection) Rear view of a White 1977 Ghia optioned Mustang II coupe. 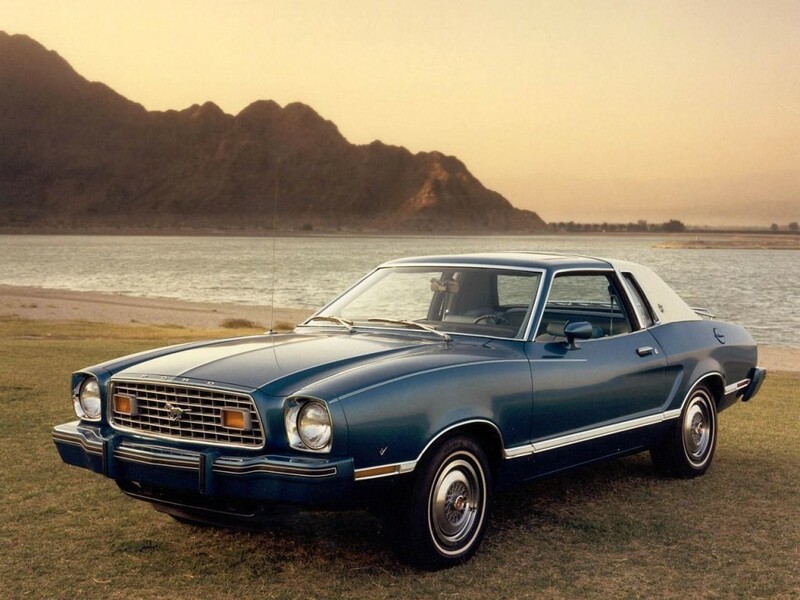 (from page 10 of the 1977 Collection) Light Aqua 1977 Ghia Mustang II coupe, left side view. The gas cap has a metallic finish. (from page 12 of the 1977 Collection) We talked to the owner and he says that this car was originally polar white and had a green vinyl roof, so he restored it to match the cover of the early 1977 Ford Mustang promotional booklet, even down to the green vinyl side molding and green pin stripes.